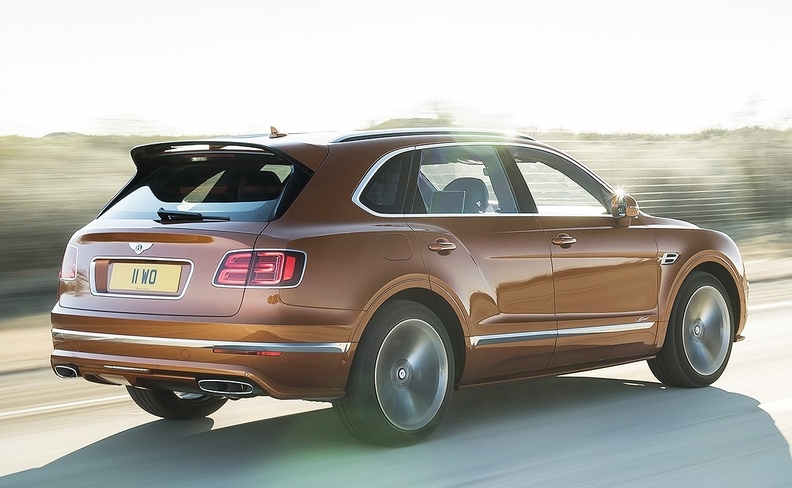 The Bentayga Speed has body-colored side skirts, a tailgate spoiler and dark-tint headlights. Bentley Motors, facing more rivals in the ultraluxury SUV market, plans to introduce a high-performance version of the Bentayga at next month's Geneva auto show as the ultraluxury automaker continues to build out the model's lineup. Power on the Bentayga Speed comes from an updated W-12 engine, which has 626 hp, up from 600 hp in the regular W-12, and 900 Newton meters (664 pound-feet) of torque. The Bentayga Speed has a top speed of 306 kph (190 mph), Bentley says. It comes only with an eight-speed automatic transmission and all-wheel drive. The Speed also receives unique design elements inside and out. They include dark tinted headlights and taillights, side skirts, a spoiler, 22-inch wheels and "Speed" badges. Inside, Bentley used Alcantara throughout the cabin, the first time it has used the high-end synthetic suede inside the SUV, the company says. Instead of the Bentley logo on the seats, the automaker has replaced it with the word "Speed." Bentley, in a nod to its racing heritage, introduced a Speed variant with the Continental GT in 2007. The Bentayga Speed is the latest variant Bentley has rolled out since the SUV was launched in late 2015. Bentley added a V-8 powered Bentayga last year and a plug-in hybrid version is expected to go on sale this year. Pricing for the Bentayga Speed was not announced but it will go on sale later this year. Bentley, the first ultraluxury brand to field a modern SUV, faces new competition from the Rolls-Royce Cullinan, Lamborghini Urus and Maserati Levante. In addition, Jaguar Land Rover markets some Range Rover models with prices that exceed $200,000. Separately, Bentley last month said it plans to show a special edition model in Geneva to mark the automaker's 100th anniversary this year. Autoweek says the model is expected to be based on a 2019 Bentley Continental GT that will pay homage to the 4 1/2 Liter "Blower" Bentley that ran in the 24 Hours of Le Mans in 1930.